Aren’t they adorable? I think they’re so cute! Anyway, I decided within a few minutes of seeing them that I’d design some crocheted bear mitts similar to them. And I’m glad I did. They’re really fun to wear! 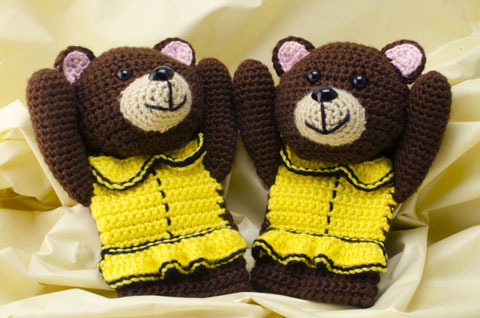 If you don’t care for the yellow dress, you can simply make your bear mitts with a different color of dress (it’s absolutely your choice on that part of the pattern)! And if you’d like to embellish your bear mitts with buttons or bows, I think they’d look great with those, as well (I think a bow at the top of the head or off to one side would be adorable!). 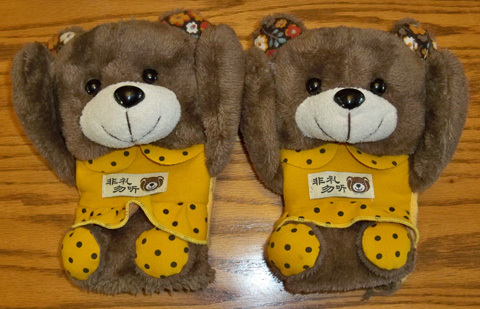 The 16-page written pattern for these Bear Mitts includes many photos of the individual pieces for ease of identification and construction. As always, if you have a question about one of my patterns, I provide free pattern support for all of my patterns here at The Crochet Architect. I learn as much from my customers’ questions as they do from my answers (and I always welcome questions). That’s how we all learn, right? 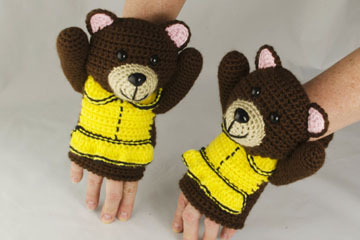 If you’re an intermediate crocheter (or an adventurous beginner), I hope you’ll give these bear mitts a try. They’re great for helping to keep your hands and wrists warm! And they’re very stylish, too! You can find the pattern right here for sale on our pattern page. This entry was posted in Crochet animals, Crochet patterns, Designing and tagged crochet, crochet patterns, Designing, published design. Bookmark the permalink. Absolutely adorable! 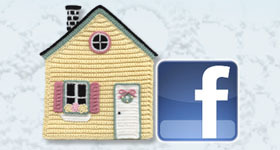 I’m going to share on my facebook page today. I’m glad you like my bear mitts. Please share this blog post (and the bear mitts photos) to your heart’s content!